The Hotel Doni, a.k.a. 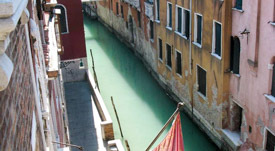 the Albergo Doni, is a rarity in Venice: an economy-priced one-star property in a neighborhood of three-, four-, and five-star hotels. The rooms are simple (some lack private WC and shower), but you'll appreciate the convenience of being only a couple of minutes from the Piazza San Marco. As you leave the Alilaguna Blu airport-boat pier at San Zaccaria, walk toward the left side of the Hotel Savoia & Jolanda (the rose-colored building straight ahead of you). Continue a short distance to the Hotel Doni, which faces the canal.